After the botanical gardens, we headed to the one history museum in New Orleans on our schedule: the Cabildo. It’s one of nine historic properties that make up the Louisiana State Museum system. The Cabildo is a Spanish colonial building next to St. Louis Cathedral, on Jackson Square. Cabildo is Spanish for a council that governs a municipality, and the Cabildo was built in the 1790s, when the Spanish ruled Louisiana, as a municipal building (a mansard roof was added by the French, later). The Louisiana Purchase transfer ceremony took place there in 1803. After the Civil War, the Cabildo housed a courtroom and it was there that the Plessy v. Ferguson case started (it eventually went all the way to the Supreme Court). Plessy v. Ferguson, for the non-Americans, was an 1896 legal decision that upheld racial segregation and codified the separate but equal policy. Homer Plessy was an octoroon (1/8 black and 7/8 white, and therefore black according to Louisiana law) who bought a first-class train ticket in New Orleans and proceeded to sit himself in the whites-only first-class railway car. For that, he was arrested for violating the Separate Car Act, which required him to sit in the blacks-only railway car. His argument, in court, was that segregation — which forced blacks to use services different from whites — violated the 14th amendment, which guaranteed equal treatment under the law. The Supreme Court ruled that just because services and accommodations for whites and for blacks were separate didn’t mean that they weren’t equal. Insert eye roll here. 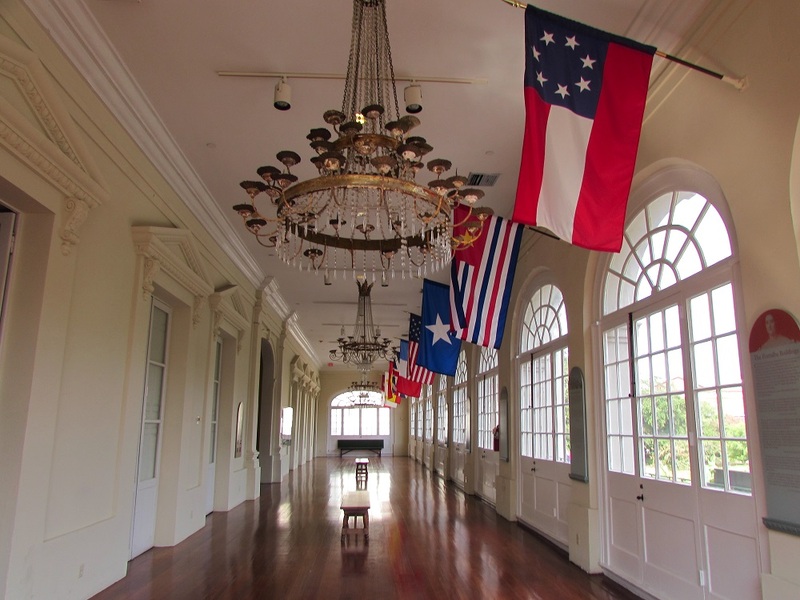 Since 1911, the Cabildo has housed part of the Louisiana State Museum’s collection. I thought about using it as my Halloween ghost post, because an unusually large number of its objects have to do with death or spirits or something otherwise Halloweeny. 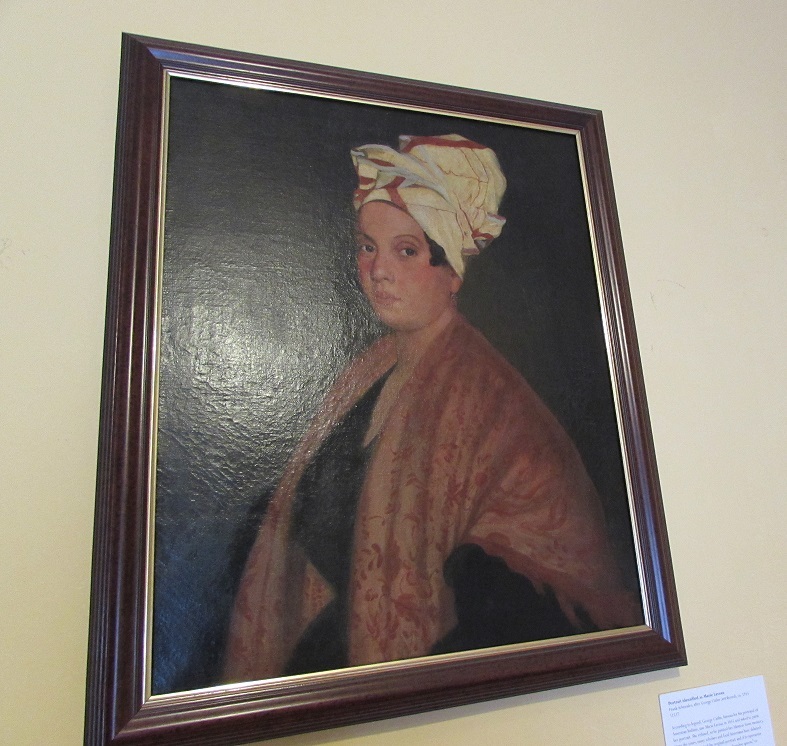 The Cabildo’s most popular object is this painting, purported — no one knows if it really is — to be of Marie Laveau (1794-1881), who was known as the voodoo queen of New Orleans. The story goes that painter George Catlin (famous for his mid 19th century paintings of Native Americans and the American west) met her and asked her to sit for a portrait. She said no but he went on to paint her anyway, from memory. The Catlin — and another “no one knows” is whether it was really painted by Catlin — portrait ended up with the Louisiana State Museum which, at some point in the early 20th century, sold it to art collector Simon Shwartz. That original has been lost. The one now hanging in the Cabildo was a copy made in 1922 by Louisiana State Museum resident artist Frank Schneider. 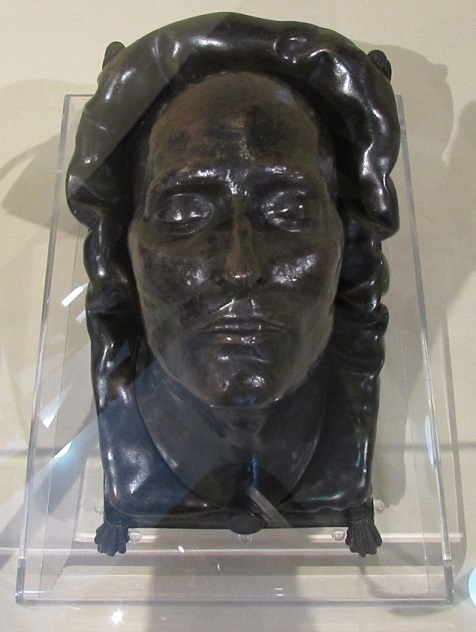 Another popular object in the collection is Napoleon’s 1821 death mask. It is attributed to (though its origins, too, is not without some controversy) one of Napoleon’s physicians. 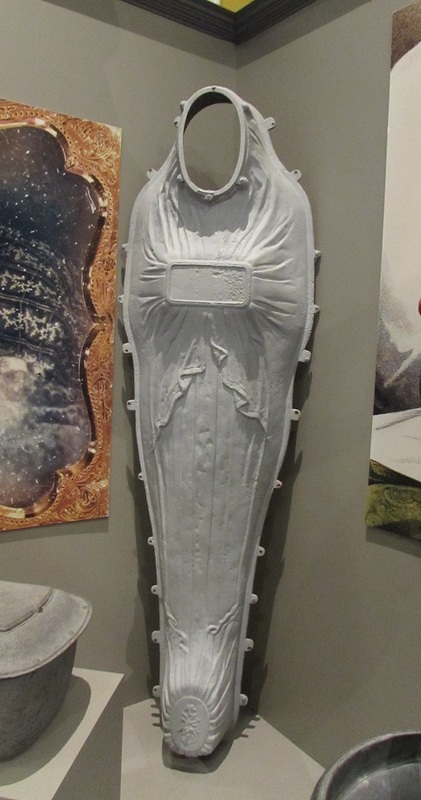 The physician was attending Napoleon when Napoleon died and the physician made the mold a few hours later. He — the doctor, not the dead Napoleon — eventually moved to New Orleans and presented the mask to the city in 1834. This (for me) was the creepiest object in a room full of creepy objects about the many yellow fever epidemics that tore through New Orleans: a lid from an 1856 cast iron casket. The hole where the face would be, that probably had once been covered with glass, is just… shudder. Just being in that room made me nervous. I took the photo and walked, very fast, out of there. That’s the end of the New Orleans posts but before we leave, one more restaurant review. Between the botanical gardens and the Cabildo, we had a very late lunch at a French Quarter restaurant called Kingfish. That’s the nickname of a colorful, populist early 20th century governor of Lousiana, Huey Long (1893-1935). My entree was just okay, but what was really memorable was the bread pudding. The pudding wasn’t overly sweet and the caramel sauce over it was perfection. Best. Bread pudding. Ever. Gallery | This entry was posted in Louisiana and tagged Cabildo, Kingfish Restaurant, Louisiana State Museum, Plessy v. Ferguson. Bookmark the permalink. The next time you’re there be sure to eat at Tujaque’s in the French Quarter. Wonderful bar, great New Orleans’ flavor, and excellent food! Thanks for the recommendation. We really struck out with food this time — so unusual in NOLA — so need a new bunch. Will definitely try Tujaque’s. That’s what I thought was strange about the iron casket: would I want to spend eternity looking out at a bunch of dirt? I don’t know why the room was creepy, other than all the funeral reliquary in there. In fact, now that I think about it, the entire building was a little creepy. Napoleon looks rather like Jesus there and perhaps a bit too young? Interesting you should say that. When I saw it, the first thought through my mind was: “He looks like he’s had plastic surgery.” Perhaps the plaster stretches everything back and down? I hadn’t thought of that, I guess you may be right! Even creepier thought about the casket with the glass – maybe they wanted to be able to see the corpse for a while before burial to make sure they were really dead? That’s a thought. A very creepy thought. I’ve always wondered about death masks – would you place a loved one on the mantle? The hallway? The foyer? It’s not like having ashes around. That’s true. Not very practical, is it. I doubt I’d have one done in the first place but if I did, I guess I’d hang it in the study. That makes sense – along with the hunting trophies.